Update: Microsoft has lifted their support for this product by April 2013 and recommends users to migrate to Skype. Though this tutorial has lost its importance, I am keeping it on CoreNetworkZ with a legacy status due to the volume of traffic this tutorial generated. This tutorial explains how to disable Microsoft Windows Messenger (WM) on your XP computer via Group Policy Editor. Before proceeding to the steps to turn off this application, you must learn about it. It is an Instant Message service program designed by Microsoft Corporation. Just like popular IP Messenger, this program also helps to send instant messages to another device in the same network. Though this application is very much useful for people in a LAN, it can disturb single users. It may generate pop-ups related to this application and its uses and that might irritate users who are not interested to use it. If you are one among them, read the steps explained to disable Windows Messenger from Group Policy Editor. The steps to disable WM and its Pop-Ups on a laptop are briefed below. On Run window type gpedit.msc and press enter. Now the Group Policy Editor window will be opened. PS: gpedit.msc is the run command to open Group Policy Editor. 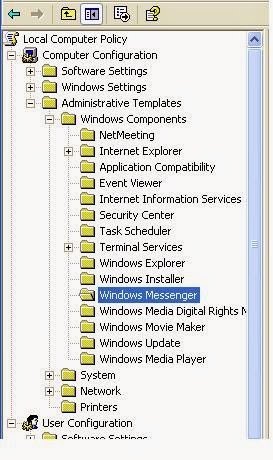 Double click on the attribute i -" Do not allow Windows Messenger to be run" and click enable button. Then click on OK.
Once you have completed the procedure WM is disabled and you will not receive pop-ups anymore. In case if you want to enable this application, you may follow the same procedure and just revert the changes we made.